Pretzel Dessert Nachos are a new twist on a savory favorite. 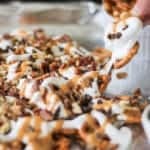 Salty pretzels are used as chips and topped with peanut butter, marshmallow cream, chocolate chips, and buttery toasted pecans. Did you ever think that you would transform the humble pretzel? Let me tell you how I did with pretzel dessert nachos! My oldest son never met a soft pretzel he didn’t love. My youngest prefers a small stick pretzel that he can lick all the salt off of. When I purchased the small twists, because they were the “bobo” or a generic brand and a fraction of the price, I stared at them until Connor came to steal the bag away. I could see that the tiny pretzel twist is roughly the same size as a chip. A lightbulb went off in my dark brain. What do I like to eat with a pretzel? Peanut butter! I also like to dip my pretzels in chocolate. You know those pretzel rods that are dipped in chocolate and sprinkles? Fun right?!? Those were also an inspiration to me when making these pretzel dessert nachos. No need to heat up the oven either! 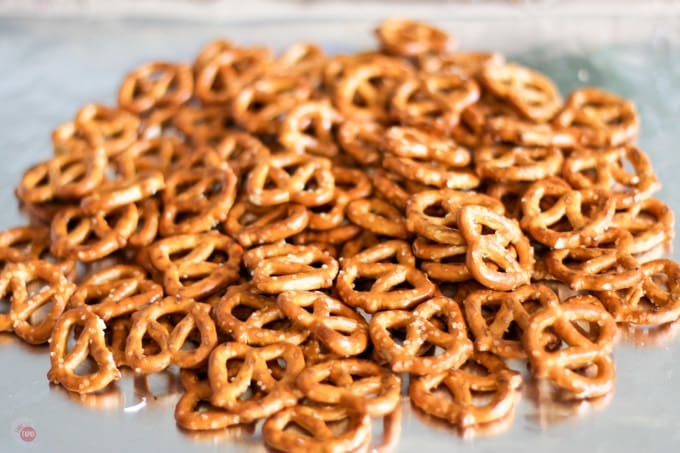 Just lay out your pretzels (the twists are the perfect shape for this) and prep your toppings. Feel free to add what you want but this combination is my favorite. When I was thinking about how to get the toppings to stick to the pretzels without melting chocolate and pouring it on there. It would harden and then you wouldn’t be able to share efficiently. I thought marshmallow! It stretches like the cheese on classic nachos and would also hold the toppings in place. I wanted them to look like traditional nachos so marshmallow was the way to go. To make it spread easier, I just put some in an icing piping bag, or a zip top bag, heat up for 15 seconds in the microwave and piped it over the top. You can also just heat it up in the jar and pour that way. Piping helped me ensure total coverage. Who likes to get a nacho chip with no toppings? NO ONE! The piping method also made it less sticky so I did the same thing with the peanut butter. A little heat and you can almost pour it over the top! Once the base toppings were in place and made the pretzel dessert nachos stretchy I topped with mini chocolate chips and some of my toasted pecans. Look at that marshmallow stretch! Anywhere you grab a nacho you will get some stretchy toppings! Once the peanut butter and marshmallow cream cool for a few minutes, they are ready to devour! I know that the word dessert is in the title of this pretzel dessert nacho recipe but life is short so eat dessert first! I know these are dessert nachos but even savory nachos Italian Sheet Pan Nachos are a good compliment too! If you want to make it fun, have everyone bring their own favorite sweet topping! 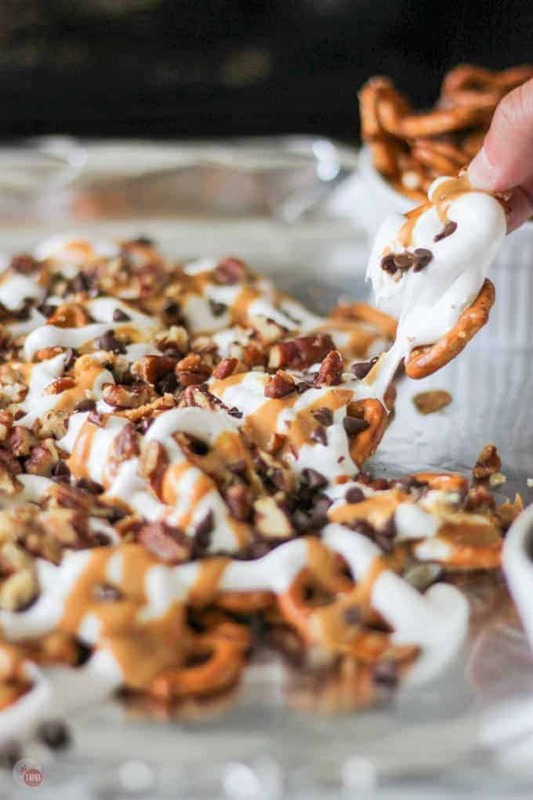 You will be a star if you bring these pretzel dessert nachos to your next party! I am already so addicted to pretzels and these look awesome!!! Thanks for sharing your recipe Sunday this week. Now I have to go satisfy my chocolate cravings. Wow, I love nachos, and this looks amazing. Thanks for sharing the recipe! Thanks Jake! My gyro ones are pretty good too! Yummy! Those are my kind of nachos, and what a wonderful way to use up leftover pretzels. Thanks Kristl! I hope you are doing well!! I am a sucker for dessert Nachos! But with Pretzels? That’s even better!! 😀 It looks so delicious J and I can wait to try it! What a yummy dessert idea! My family will love this! This is rather genius!!! 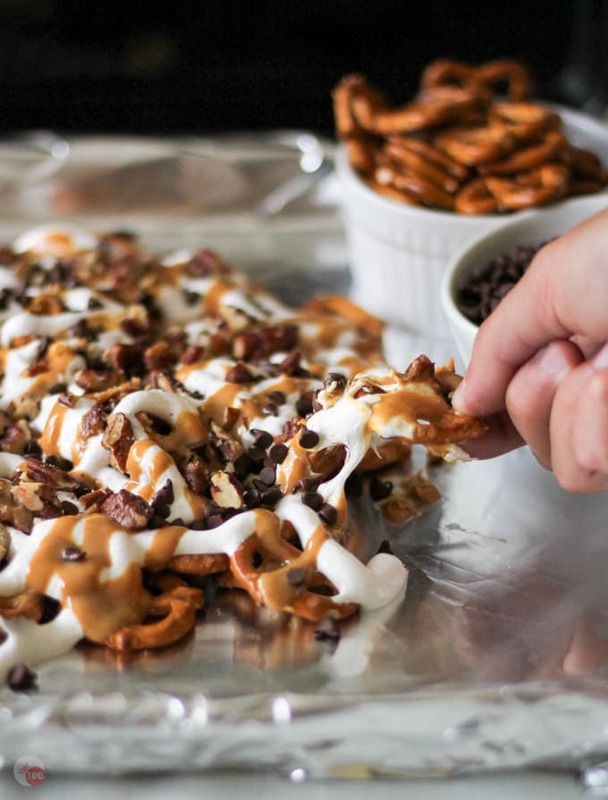 I love the idea of pretzels as a base for sweet dessert nachos! My family would go crazy over these! Awesome idea! Jennifer, this recipe is too much fun! And by that I mean, SO much fun!! I love that your whole family loves so many different kinds of pretzels. 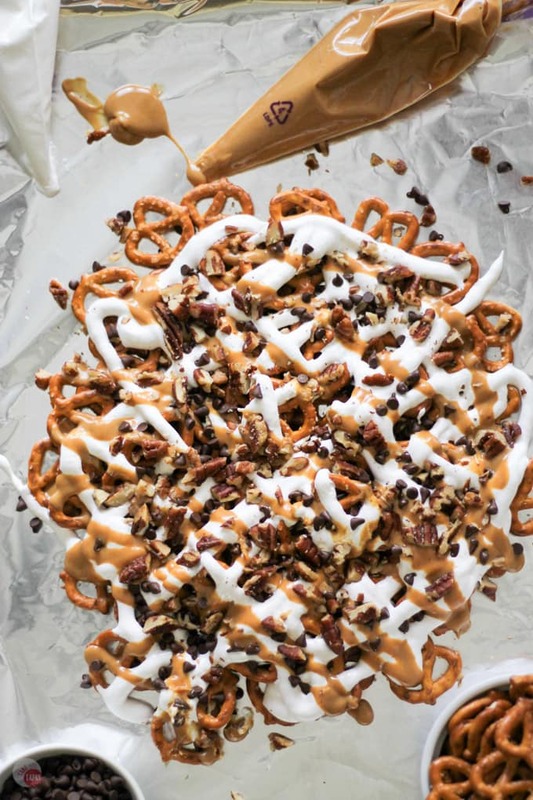 Plus, pretzel dessert nachos: SUCH a fantastic and creative idea! Perfect for this summer heat, when none of us want to turn on that hot oven. Plus, the buttery toasted pecans definitely take these dessert nachos to the next level. Love it! Thank you, Demeter! I love “cooler” nachos, in all sense of the word! Those pecans put them over the top for sure! I love finding way to keep using them since I have bags and bags of them. Pecans are seasonal here and love to get them local and then freeze them. They are great for pies too! Thanks so much! I’ll show up for sure! 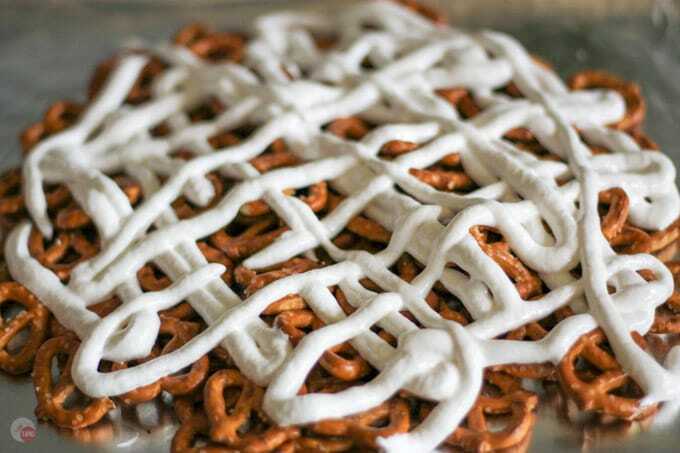 I am already so addicted to pretzels and these look awesome!!! Thanks for sharing your recipe at Share The Wealth Sunday this week. Now I have to go satisfy my chocolate cravings…LOL!!! I have to admit you had me at dessert nachos. This is absolutely clever. Saving and making for later. Thanks for another great recipe to share with us on #shinebloghop! Yum, this sounds good, and I’m not even a big fan of pretzels. Somehow, you managed to make them look fancy, too! 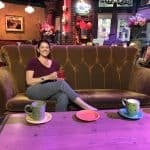 Thanks for joining us at the Family Joy Linkup! Hope to see you again next week! You are talking my love language with these! They look great!